Tony Finau shot a 5-under 67 to move into a three-way tie for the lead at the Hero World Challenge at Albany Golf Club in the Bahamas on Saturday. After a bogey on the second hole, Finau rebounded with four birdies to finish the front nine and two more on the back to go into the clubhouse in a tie for the lead. Henrik Stenson and Jon Rahm both shot 3-under 69s to finish the day in a tie with Finau at 13 under. Gary Woodland also shot a 5-under 67 to move to 11 under on his own in fourth place. Defending champion Rickie Fowler posted a second consecutive 5-under 67 to move into 10 under for the tournament in fifth. He posted an eagle at the 14th after a superb shot on a drive-able par 4.
? @RickieFowler just threw a dart with a DRIVER. Tiger Woods is all on his own in last place after an even-par 72. Woods made five birdies on the day, but that was in a round where he posted bogeys on three holes and a double-bogey at the par-5 third. The round just never came together for the 14-time major champion who is at 2 under after three rounds. 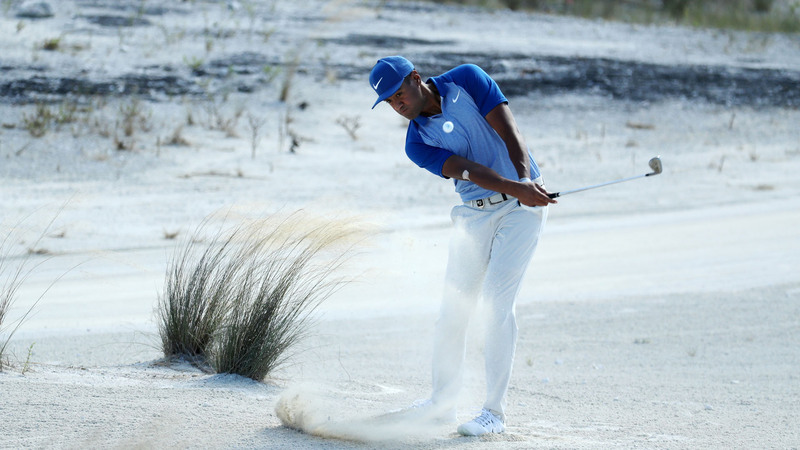 “Just one of those days where I felt like I was fighting from behind,” Woods said.